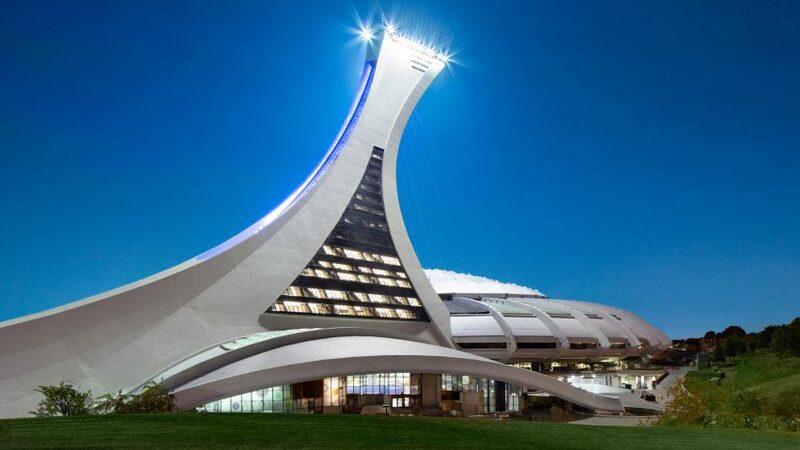 The iconic angled tower of Montreal's Olympic Stadium is being converted into offices by local firm Provencher Roy. Provencher Roy is overhauling the Montreal Tower for AccèsD, the online payment platform of the Desjardins Group – a leading cooperative financial group in Canada. The iconic structure forms part of the stadium designed by French architect Roger Taillibert for the 1976 Olympic games. Located at one end of the elliptic venue, the 541-foot-tall (165-metre) tower slants over and holds the cables that support its retractable tensile roof. This portion of the building also originally contained a funicular that could carry 50 people at a time to the top, providing views of Montreal's Olympic Park. It had been vacant for three decades, until Provencher Roy's renovation work began in 2015. "After its 30 years of concealed existence, we are now finally unveiling to the whole world the structure of the Montreal Tower," said Anik Mandalian, project manager and partner architect at Provencher Roy. Set to complete later this year, the project involves rehabilitating the tower's concrete facades, as well as redesigning the interiors. A focal point of the renovation will be a glazed curtain wall across its sides, which will replace an existing prefabricated concrete envelope. "The biggest challenge was undoubtedly the stripping of the tower's concrete facings to make way for the transparency afforded by a glass curtain wall covering 60 per cent of the facade — an essential element in creating a pleasant work environment," said a statement from the firm. "The use of curved insulated glass being neither practical nor economically feasible, it was necessary to eliminate the curvature of the tower's facings by extending the existing slabs so as to make the latter parallel on all storeys." The revitalisation of the 1970s building is made possible with building information modelling (BIM) technology. Laser-scans of the structure created point clouds of its form, which in turn produced a high-resolution 3D model. "This provided the team with an extremely precise picture of the project and its challenges, and allowed them to update the drawings made in the 1970s," said the firm, which won a CanBIM Design & Engineering Award for its work on the project. The technology gave further insight into the complex internal structure, which enables the tower's 45-degree angle and helped it become the tallest inclined tower in the world. The total project entails facade work that spans 317,373 square feet (29,485 square metres), and curtain wall work of 277,289 square feet (25,761 square metres). Inside, renovations will encompass an impressive 430,556 square feet (40,000 square metres) of floor space, including updated mechanical systems. Renderings of the interiors show a grey and white palette for modern workspaces, with added windows providing more sunlight than the original design. Montreal Tower perches atop the Olympic swimming pool, and sits beside the velodrome building that now contains the Biodome – an indoor zoo, an aquarium and a botanical garden. In 2014, plans were revealed for a redesign of the Biodome, with a series of new spaces inside by local firm KANVA, and AZPML of London and New York. Photography is by Stéphane Brügger.